Talkin' Tuesday, NOT Taco Tuesday, although that sounds really good. Talkin' Tuesday is when I set a timer for 5 minutes and just talk about what's going on. Totally Random. The heck with that darn Living Room Spring Cleaning Checklist right now! If I don't get into that craft room and get it clean, I might go out of my mind. It's like a dread even opening the door to go in there. And if I'm looking for something? Forget about it! I really need to hit the ground running this morning if I'm going to get that done. That's why I'm SO happy I don't have anywhere to be today. .. . or at least I hope I don't have anywhere to be, because guess what? I'm not going to be there. Because I don't remember that I have to be there. "Oh well, The Builder (son) gets up at 6:00. If nothing else, if it gets later than 7:30, he'll come find me and wake me up. If he doesn't, I'll just drive the kids to school." Why was I sleeping in the craft room? It really is TMI, but I had waaaay too many veggies yesterday. 'nuff said? Right now I'm warming up that soup I made for breakfast yesterday. . . . and maybe we just began that cycle again. I think coffee would taste terrible with this soup and that's why I didn't drink a drip of coffee yesterday. I won't make that same mistake today. Mmmmm. . . . coffee! I just remembered I need to start the stuffed pepper soup in the crockpot. I think I'm going to throw my zucchini in there also, because otherwise I don't know when I'm going to use it. The timer just went off. My time is up! 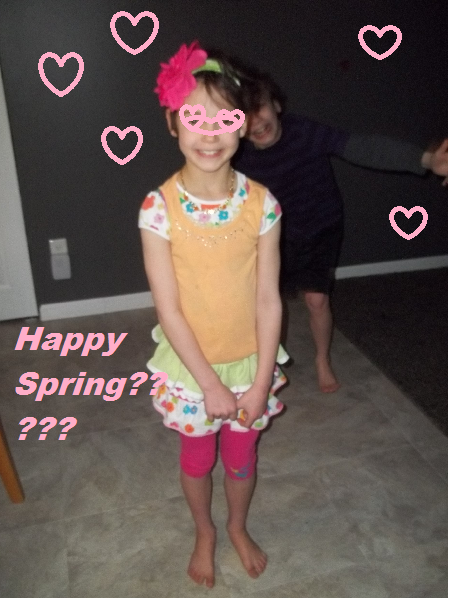 But, on a last note. . . . my daughter does not realize that it's still 20 degrees out. She insists on wearing shorts and capris lately. I can't blame her. We've all had enough of Winter and all of the bajillions of Winter clothes that we have to wear to stay warm. What are your totally random thoughts right now?